This is Chapter 3 of The Urban Aquaponics Manual – 4th Edition. In the previous chapter, we looked at how aquaponics works from a basic microbiological perspective. In this section, we learn how to optimise the conditions under which the beneficial bacteria work – in the best interests of fish health and wellbeing – from a practical perspective. Sedimentary – usually comprise fish faeces and uneaten food that will settle out if water velocity is low enough. Suspended – small particles of food or faeces that are neutrally buoyant – they neither sink nor float but are carried in the water flow. Dissolved – largely ammonia arising out of the gills or generated by the mineralisation of fish wastes – they are in solution. Filters are the means by which we optimize water quality for our fish…by capturing sedimentary and suspended solid wastes and/or converting the dissolved wastes that they produce – which would otherwise eventually prove toxic to them – into a more manageable form. The devices that we use to capture solids are mechanical filters and those that we use to oxidize (nitrify) dissolved wastes are biological filters. This list is far from exhaustive but these are the filtration devices most commonly used in small-scale aquaculture. 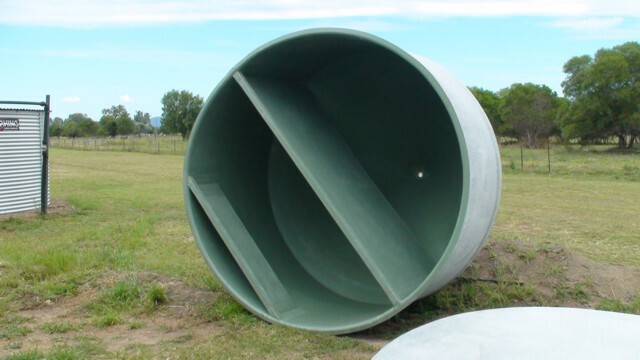 Sedimentation tanks serve to reduce the velocity of the water flow so that sedimentary solids will settle to the bottom where they can be removed. In essence, the longer the water remains in the sedimentation device, the greater the volume of solids that will settle out. The minimum retention time is 20 minutes – more is better. For example, if the fish tank is 1,000 litres – and the flow rate is 1,000 litres per hour – then the sedimentation tank should contain not less than 330 litres of water. 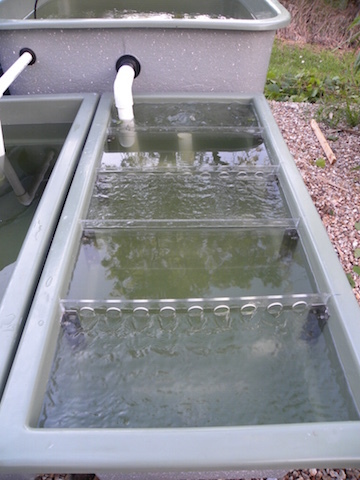 Some sedimentation tanks are fitted with weirs to assist the settling process. This is a variation on the sedimentation tank idea. The water passes under the first weir – over the second one – under the third weir and over the final one. Clarifiers (not my preferred name for them) are another form of sedimentation tank. They usually comprise a round tank with a cone-shape bottom and they are fitted with baffles that direct the water flow downwards – with the idea that the solids keep travelling toward the bottom. Like all sedimentation devices, clarifiers rely on a reduction in water velocity to function effectively…with the added effect of directing the watery solids downwards. This is a clarifier of the type used at the University of Virgin Islands Aquaponics Research Center. The water enters the small chamber and is forced downwards. As it enters the second chamber, it is forced even further downwards – causing the sedimentary solids to settle in the clarifier apex. In my view, there are other sedimentation devices that are easier to build and are more efficient in their use of space. Swirl Tanks rely on centrifugal action (specifically the ‘hydro-cyclone effect’) to force heavy particles (solids) to the outside of the tank where they then settle to the bottom for easy removal. This is an inside view of a swirl separator. The water enters via the 90 degree bend and exits through the pipe on the left. 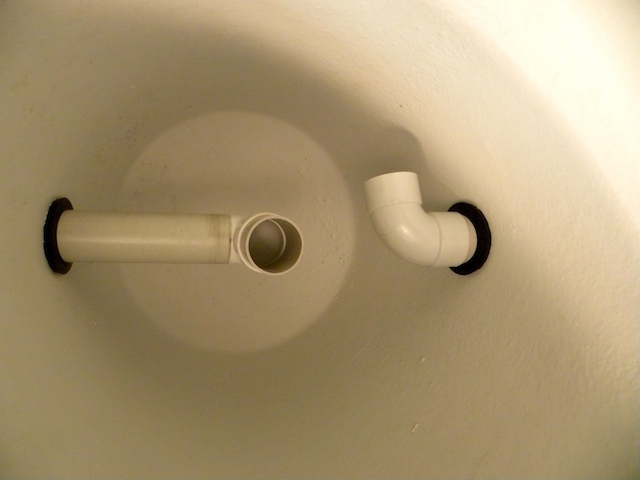 An upright pipe (removed for viewing clarity) sets the level in the tank and serves as a weir. Swirl filters are easy and cheap to build but radial flow separators are much more efficient – and they are no more expensive nor difficult to build. 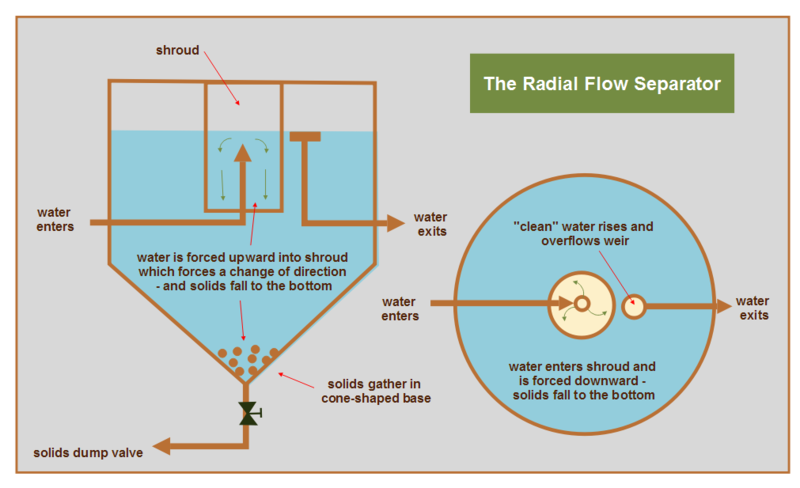 The water (containing particulate matter) flows from the fish tank into the centre of the radial flow separator where it is forced downwards. 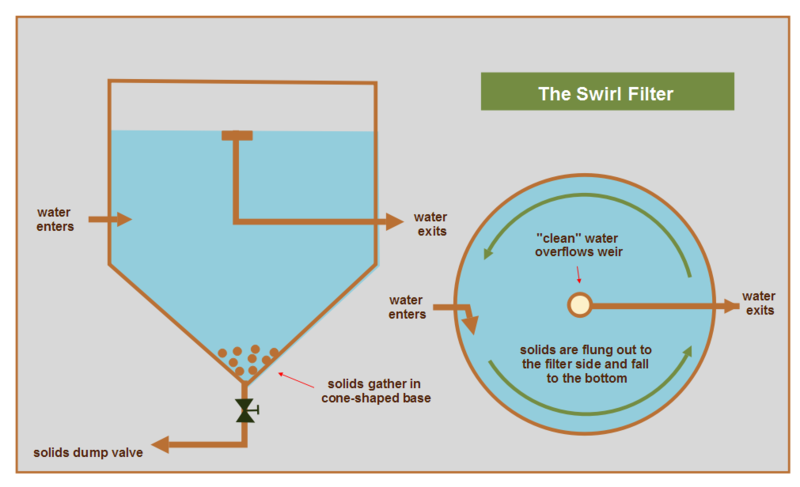 The water velocity drops abruptly at the change of direction and the solids continue downwards and settle out while the clear water exits the separator via the overflow weir. Packed media filters are designed to trap suspended solids – those that maintain neutral buoyancy – and carried around the system in suspension. There are a variety of different types including manufactured media (using Kaldnes K1 – or similar – filtration media), filter mats and brush filters. Packed media filters function by allowing the water to pass through various types of static media. 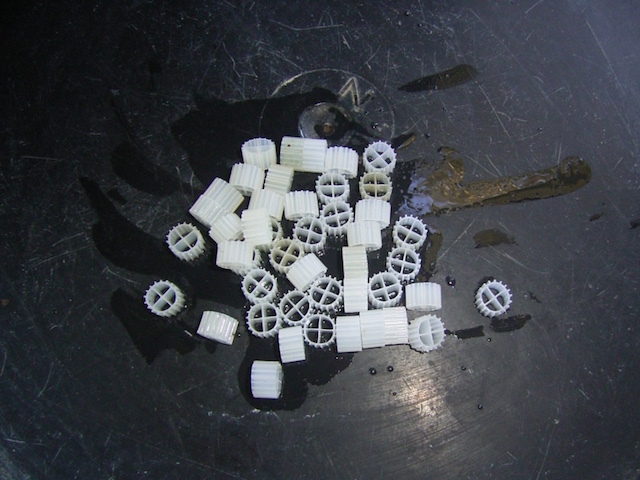 After a short time in the water, the media in the filter will become coated in a sticky substrate – biofilm. As the water passes through the filter, the suspended solids adhere to the biofilm where they remain until the media is cleaned. 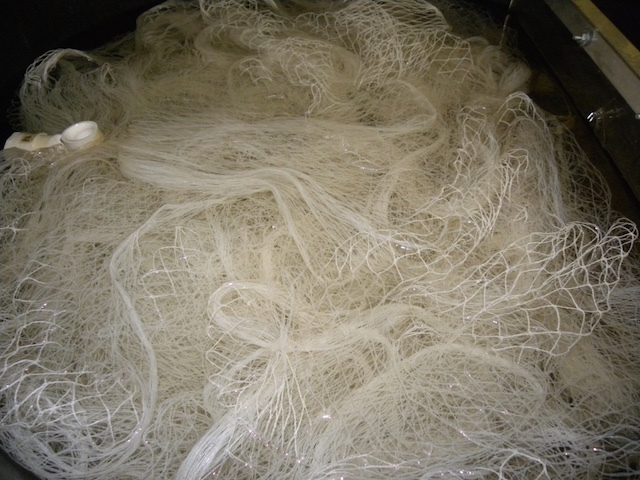 Nylon bird mesh is inexpensive and effective at trapping solids – but cleaning it is an ordeal. Matala mat comes in different densities (denoted by colour). 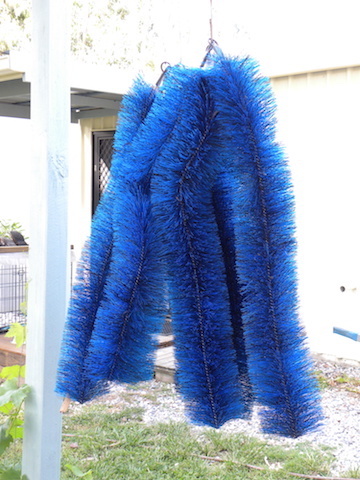 It’s effective at capturing solids, is more expensive than bird netting but easier to clean. This box filter (used in a small commercial system) utilises Matala mat to good effect. Brush filters are effective at trapping suspended solids, relatively inexpensive and easy to clean. They are suspended in a barrel so that the solid-laden water flows up through the bristles. The suspended solids adhere to the ‘sticky’ biofilm. 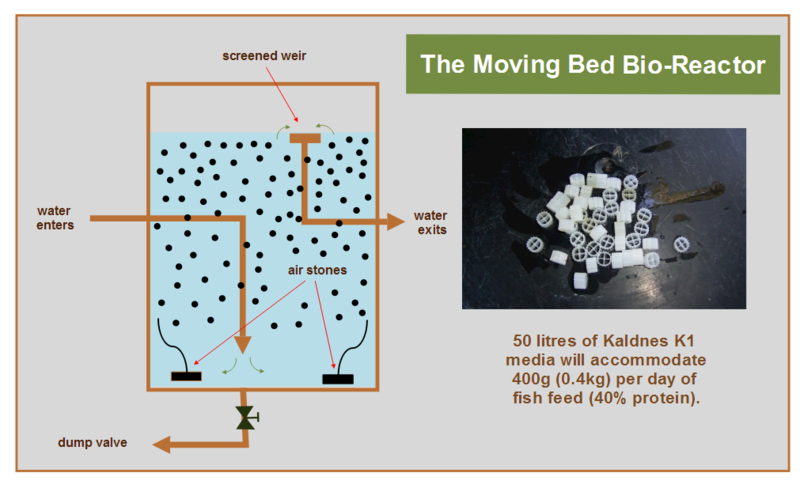 Manufactured plastic media (in this case, Kaldnes K1) is just as effective in a static packed media application as it is the moving bed bio-reactors for which is was originally designed. It offers high specific surface area (to produce a correspondingly large space upon which biofilm forms) and cleaning it is as simple as ‘boiling’ it with air. This causes the tiny sections of media to rub against each other – dislodging the accumulated solids – which are then easily drained from the filter. Some of these are very effective (others less so) and those that are effective are priced accordingly. To be candid, you can achieve perfectly acceptable water quality – for a lot less money and hassle – with the DIY options that I’ve described. Having got the bulk of the solids out of the system, it’s then time to facilitate ammonification of any remaining suspended and dissolved solids – and then to convert the ammonia into nitrites and subsequently into nitrates. Biological filters are simple devices that facilitate the colonization of the beneficial bacteria that are central to recirculating aquaculture. As the fish tank effluent passes through the biofilter, the remaining solids are exposed to the bacteria that facilitate nitrification. There are other types of biological filters including rotating biological contactors, bead filters, and fluidized bed sand filters….but those that I’ve listed are those best suited to backyard fish farmers – in the short term at least. Trickling biofilters have been around for more than 100 years. They were still widely used in wastewater treatment plants when I trained as a wastewater treatment operator in the 1970’s. The huge trickling biofilters, with which I worked, used rocks (about 150mm or 6” in diameter) as media. A rotating boom arrangement ensured that the effluent was distributed evenly across the media. The rock media served as the substrate to which the bio-film attached and the nitrifying bacteria lived in the bio-film. The charm of trickling filters is that they are simple to build and easy to operate and maintain. They work well across a wide range of nutrient levels. 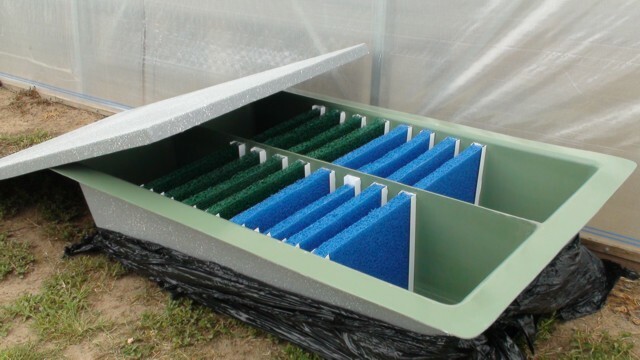 Trickling biofilters are simple devices that cost little to set up and are easy to maintain. 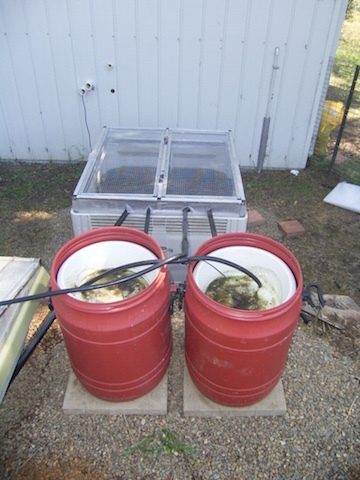 This small stand-alone recirculating aquaculture system was used to grow out jade perch. 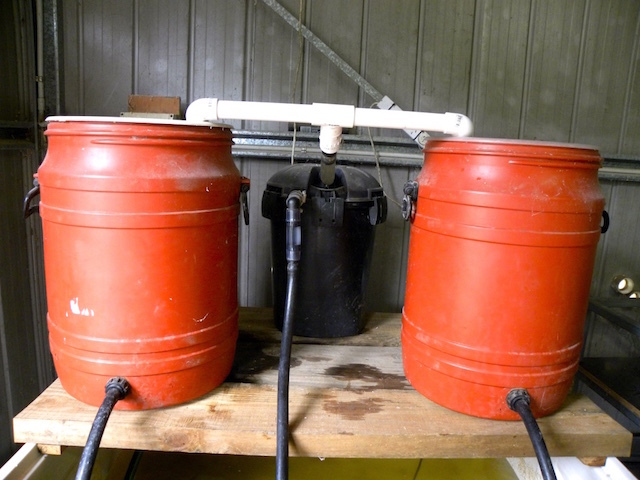 A pump (ln the fish tank) pushed the water through a cannister filter and up to the manifold supplying the biofilters. The water then percolated down through the oyster shell media before draining back out into the fish tank. The percolating action of the water as it trickles down through the media provides for excellent aeration. It also facilitates the removal of carbon dioxide and nitrogen (in gaseous form) from the water column. 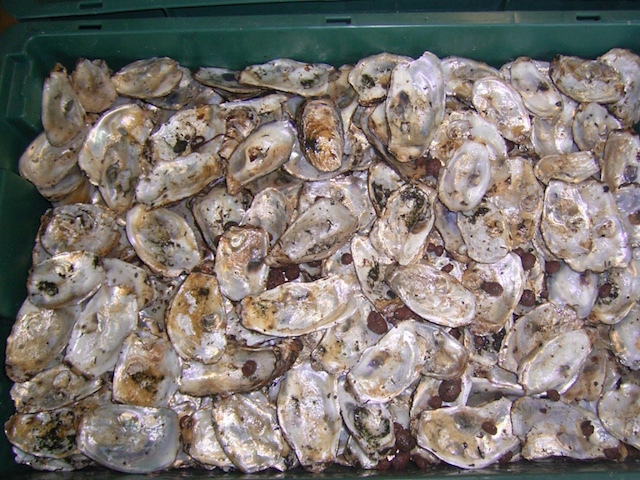 Oyster shells are our preferred media – they cost nothing and never clog. The downside of oyster shells is that, compared to other media, they have a low specific surface area (SSA). *SSA refers to the amount of surface upon which the biofilm that houses nitrifying bacteria. SSA is measured in terms of square feet/cubic foot or metres/cubic metre. In other words, if you were to lay all of the exposed surfaces of a given quantity of media (a cubic foot or a cubic metre) flat, the SSA would be the number of square feet or square metres that you’d have. My next choice would be Kaldnes K1 manufactured plastic media. Kaldness K1 is, compared to some other media, relatively expensive – but it has a very high SSA. It can be used to good effect in packed media filters, trickling biofilters and moving bed bio-reactors. Good nitrification will depend on effective water distribution throughout the filter. Large commercial biofilters often feature rotating spray arms. 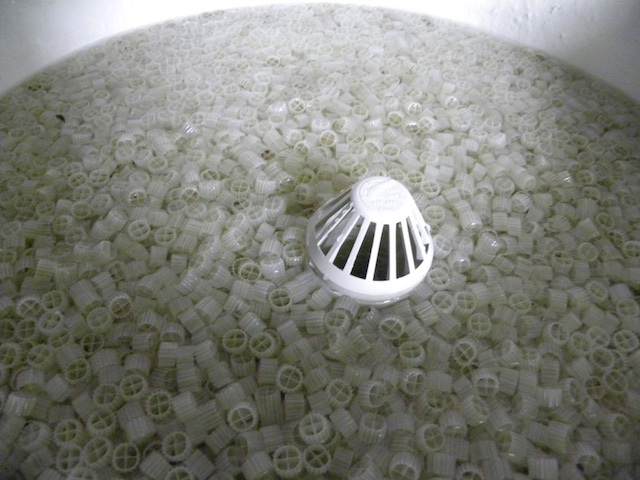 Small units will often have a deflector arrangement that spreads the water across the top of the filter media. 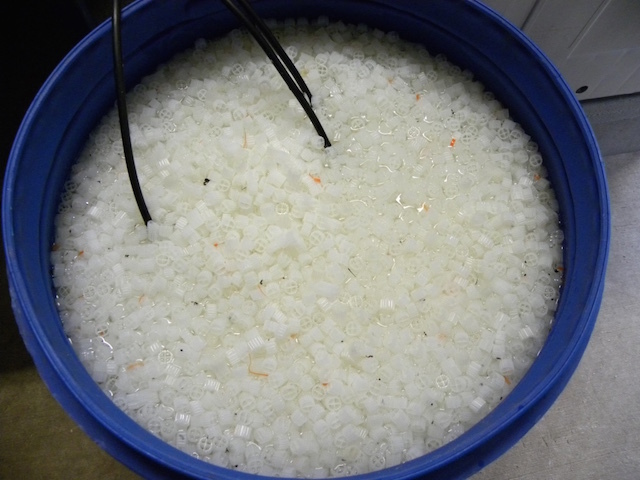 We made an inexpensive water distributor out of a plastic bowl in which we drilled holes. It functions like an oversized shower nozzle spreading the water evenly over the media. Another option is to drill 8mm holes in a PVC end cap (like a crude shower fitting) and mount the cap so that it sprays the water across the media. Trickling biofilters rely on even distribution of the solids-laden water across the media. We made an inexpensive water distributor from a cheap dishwashing bowl into which we drilled holes. The bowl functioned as a sort of shower head and spread the inflow evenly across the media. While we started out using trickling biofilters, we’ve gradually transitioned to the moving bed bio-filters pioneered by Anox Kaldnes. An MBBR consists of a barrel – or tank – filled with water to which 2/3 by volume of Kaldnes K1 media is added. The water is aerated using air stones or a diffuser. Initially, the media will float because (like all polyethylene or polypropylene) it’s hydrophobic – it repels water. The media in a new MBBR is (slightly) positively bouyant. That changes once the media has assumed the loading of a fully functioning unit. In the weeks following the commissioning of a new filter, however, biofilms will establish themselves on the exposed surfaces of the media…and the nitrifying bacteria will begin to colonise the filter. The subsequent increase in loading moves the media closer to neutral bouyancy – to the point where it takes on the characteristic slow rolling action of a functional MBBR. Getting an MBBR operating properly will take longer and require greater effort than a trickling filter – and, depending on the media choice, it will cost more to build. The creation of an oxygen-rich environment. The massive specific surface area of the media. Unrestricted water circulation through the media – no dead spots or anaerobic zones. The ability to accurately predict how much feed you can use for a given quantity of media. Manufacturer trials established that 50 litres of K1 would process the dissolved metabolic wastes arising from 0.75kg of feed (40% protein) per day. Given that your filtration methods are unlikely to be as effective (nor anywhere as expensive) as those in a modern commercial recirculating aquaculture system, I strongly recommend that you settle on a more conservative number – around 0.4kg per 50 litres of media. For the purposes of this example, we’ll assume that we have 100 fish…and we propose to harvest them at 500 grams. That would give us a total fish biomass (at harvest) of 50 kg. At a rate of 2% (of bodyweight per day), we would be feeding up to one kilogram of feed per day. Based on my recommendation of 0.4kg of feed/day/50 litres of K1 media, then we’d need 125 litres of K1 media. This amount could be contained within a 200 litre (55 US gallon) plastic drum. That level of predictability is the principal benefit of using the moving bed biofiltration process. The continuous churning movement of the media in the filter causes the tiny elements to rub against each other sloughing off the dead bacteria and continuously exposing fresh habitat for new bacteria. The great thing about this is an MBBR rarely needs cleaning and, any cleaning that does occur, is limited to draining out any sediment that forms in the base of the filter. Somewhat paradoxically, I’ll generally use a couple of small 65 litre trickling biofilters to kick start an MBBR. Using conditioned filters on a new system provides effective nitrification from the outset and will speed up the commisioning of an MBBR quite considerably…but we’ll get into the detail of that when we get to the chapter on starting up a new system. To summarise, gaining a thorough understanding of how biological and mechanical filters work – and how to use them – is essential if you are going to optimise water quality and fish health. Each of these mechanical and biological filtration methods performs a similar function – to capture solids from the water column. This list of filters is far from exhaustive. It’s merely intended to provide you with options that are affordable and within the scope of the average DIY handyperson. You can buy various off-the-shelf pond filtration devices but those that work well are expensive and the rest are not worth having. To summarise, I recommend that you equip your system with most effective filtration that you can afford. At the risk of beating the ease of cleaning thing to death, it’s important because (and I’ll explain the detail of this later in the book) filters should be cleaned frequently. Trust me, if you’re going to be doing it often, you want to make it as quick and easy as you can. Now, you may have heard about an aquaponics method that uses the growing system for filtration. The short answer is YES. In fact, there are two such ‘closed loop’ methods. One is the Integrated Aqua-Vegeculture System (iAVs) developed by Dr Mark R McMurtry. Indeed, iAVs was the precursor to everything that we now know as aquaponics. McMurtry vigorously asserts that is is not aquaponics…so the discussion of iAVs ends here…except to say, that is an exceptional way to integrate the closed loop production of fish and plants – and is well worthy of consideration by anybody seeking a productive, resilient and sustainable way to produce food. I said that there were two such ‘closed loop’ methods so, before we embark upon the design and contstruction of a recirculating aquaculture system, we should take a look at the basic flood and drain system. Question: if oyster shells are used as a filter, shouldn’t there be some concern about oyster shells dissolving and changing the pH?